There’s been lots of debate about whether mobile apps or the web have the upper hand when it comes to making content for smartphones, and when it comes to using it. Some interesting insights from Nielsen out today on how in the case of mobile shopping, for now the main audience in the U.S. seems to be much more interested in using the mobile web over store-specific apps. The research, which took into account data from some 5,000 Android and iOS smartphones in the U.S., doesn’t spell out how much money is actually spent on mobile web versus apps. And it looks like at least in the period covered by the research — which included the holiday shopping season — the results may have been particularly skewed by the sheer force of Amazon . 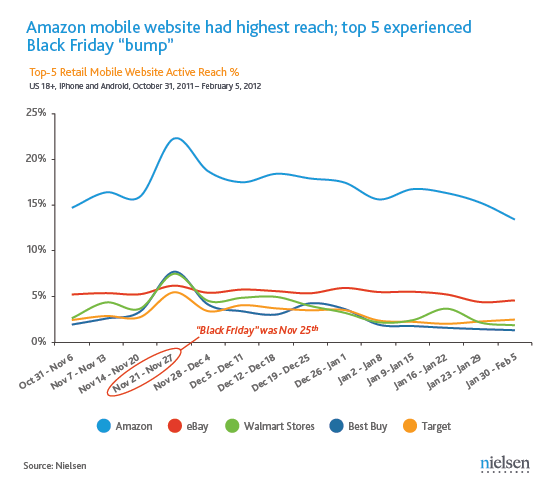 Nielsen notes that combining both mobile web and apps, the top five retailers’ sites — Amazon, Best Buy, eBay, Target and Walmart — reached 60 percent of smartphone users. But as you can see in the table above, apps appeared to attract half as many users as mobile web sites did each month. Nielsen also notes, for what it’s worth, that men are more likely to use apps than women, who opt for mobile web sites. And more men than women visited Best Buy on mobile, while Target and Walmart attracted more mobile women. eBay and Amazon, it seems transcend these lines, attracting both in equal measures. In the case of both apps and web, while users spiked during the holiday season, that was not sustained by any of them: “By January, active reach was back to October 2011 levels,” notes John Burbank, president of strategic initiatives at Nielsen.